You want to use your building differently? You need more space? You want to modernise your house? The requirements a building has to fulfil certainly change over the years. No matter the cause, we will happily assist you with planning and implementing a tailor-made architectural solution. A baby is coming. The kids have grown up and move out. A new very space-consuming hobby. The unused room in the basement. Reduced mobility in old age. Minimising energy costs. There are many reasons to go about the alteration or extension of a beloved home or a valued commercial property. In the end it is all about keeping or regaining a certain standard of living and quality of usage. It’s about a big part of your quality of life. Our clients benefit from our know-how from more than 50 years of building experience and our powerful team of planners, site managers and highly skilled and qualified builders. In preparation of the project we will perform a detailed analysis of the building and meet with you for a consultation on-site. We will carefully examine the basic structure of the building. Then we will discuss wit you your ideas and needs regarding the envisaged alteration, extension or addition. Finally we will plan the details of your project incorporate both your wishes and the structural conditions of the building. Depending on the specific project we will attend to the necessary architectural drawings and calculations and deal with the relevant authorities. Subsequently we will realise your building project – in a workmanlike manner and with attention to detail. Our clients’ biggest advantage: During your building project you only have to deal with one contact person from planning to completion. We accompany our clients through the entire project in a proficient and reliable manner. Our project manager supervises and coordinates the building process as well as the agreed budget and timeframe and keeps our clients up-to-date. That way they are always aware of what is going on, whereas we can guarantee consistent results. Since 1. January 2016 businesses are legally obligated to provide barrier-free access to their premises. But not only people with disabilities benefit from removing physical barriers. Accessibility makes life much easier also for elderly people, people with strollers, trolley cases and the like, or people who are temporarily handicapped after an accident or surgery. Plus: Everybody else enjoys better comfort as well! But accessibility is not only an issue with businesses. Adapting your home in a professional way can enormously improve the situation of elderly people who want to live independently in their own four walls for as long as possible. We, the Kummer Planungs‑ & Bau GmbH, have many years’ experience implementing accessibility measures in buildings. 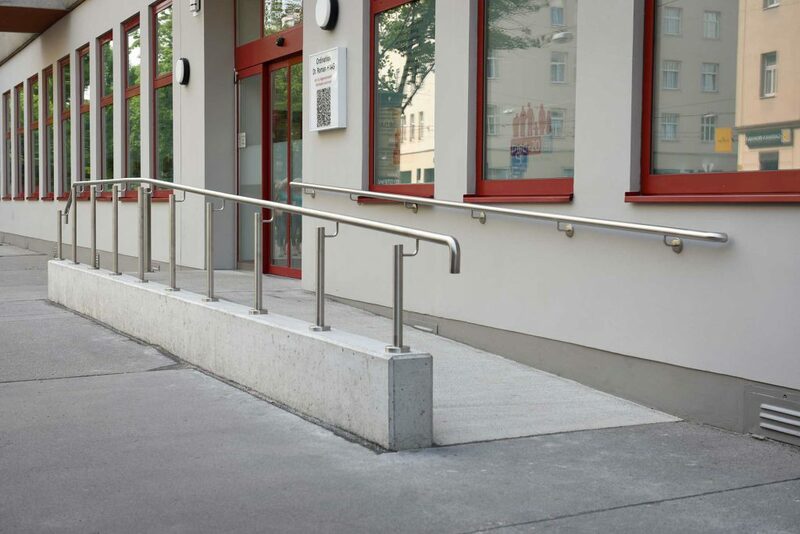 Improve the quality of usage of your building and make accessibility a major quality feature. We will be happy to to discuss your requirements with you! Accessibility: essential for some – necessary for many – better comfort for ALL! After an initial, non-committal consultation we make a tailor-made, understandable and comprehensive offer. The offered prices are fixed during the entire duration of the project.